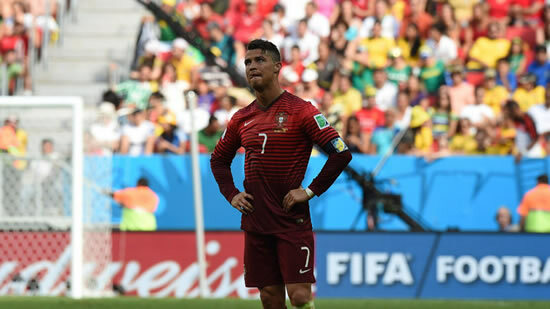 Portugal captain Cristiano Ronaldo has said that he and his team-mates are leaving the World Cup with their “heads held high”. The Seleccao finished third in Group G, level on four points with second-placed USA but with an inferior goal difference. Ronaldo, who has been struggling with a knee injury throughout the World Cup, scored Portugal’s second and winning goal in their 2-1 victory over Ghana in Brasília. It was the Real Madrid forward’s first goal of the tournament in Brazil, but his celebrations were muted. However, the 29-year-old former Manchester United winger has now said that he is proud of his side’s performance at the World Cup. "We created many opportunities but we could not finish them," he said. "We knew we had to score three goals and were depending on the result of the Germany game and we couldn't do that. "We deserved more, but that's football. We are leaving with our heads held high."